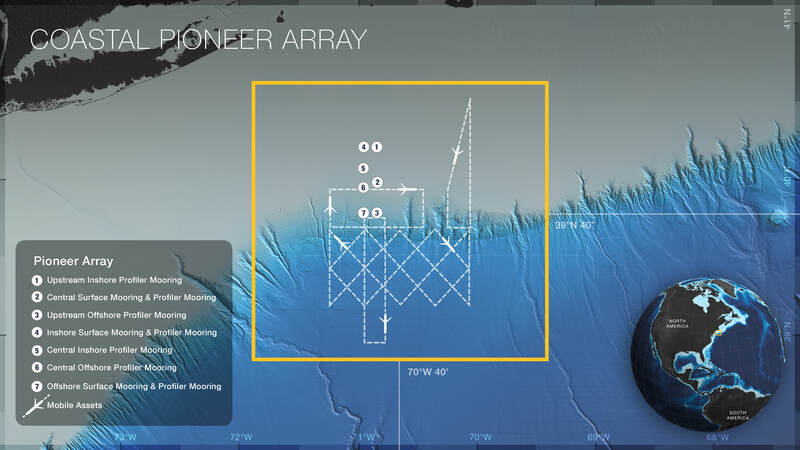 The Pioneer Array is located off the coast of New England, south of Martha’s Vineyard. The Continental Shelf-Slope area off the New England coast is a highly productive area and one that is located at a dynamic intersection where ocean currents meet in weather-like “fronts,” and where nutrients, pollutants, and other properties are exchanged between the coast and the deep ocean. Data from the inshore, shelf area helps to examine exchanges between the shelf and slope and the shelf ecosystem, as well as provide broader insight into the issues of air-sea gas exchange, including Carbon Dioxide. 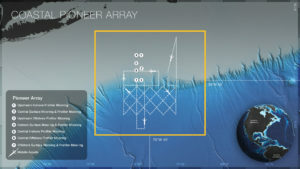 The backbone of the Pioneer Array is a frontal-scale moored array with three electro-mechanical surface moorings and either five (in summer) or seven (in winter) profiler moorings. 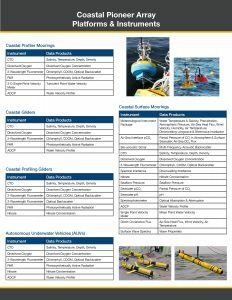 Each surface mooring incorporates a surface buoy with multiple sources of power generation and multiple surface and subsurface communications systems. Each surface mooring is anchored by a Multi-Function Node (MFN) on the seafloor. All three MFNs are capable of supporting multiple onboard (e.g., frame-mounted) sensors as well as external sensor packages connected by wet-mateable connectors. Profiler moorings include surface expressions for data telemetry and support wire-following profiling packages with a multidisciplinary sensor suite. The Offshore site is continuously occupied by both a Coastal Surface Mooring and a Coastal Profiler Mooring in near proximity (typical separation 1 km). 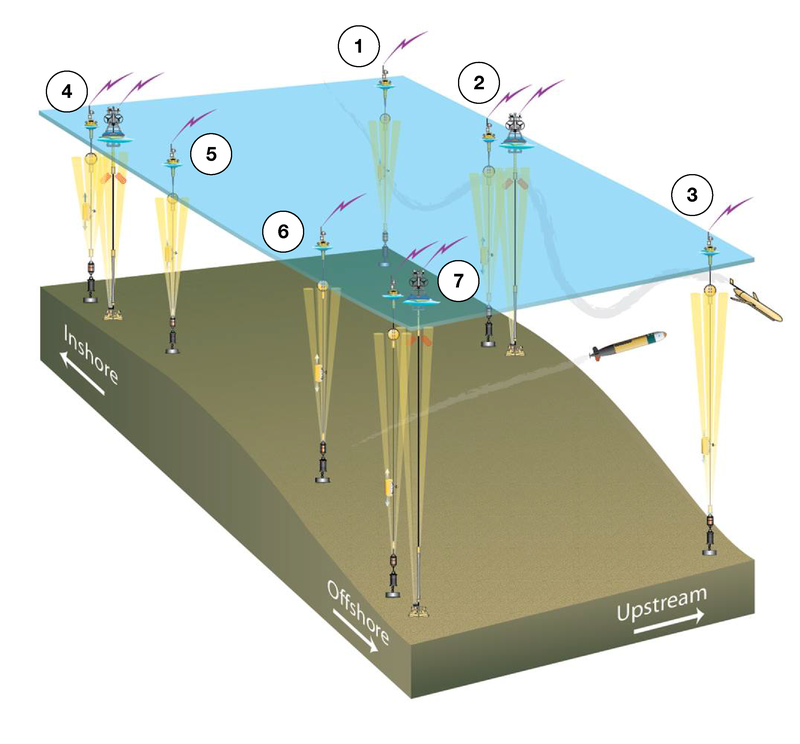 In winter, the Inshore and Central sites each contain both a Coastal Surface Mooring and a Coastal Profiler Mooring (profiling gliders replace the Coastal Profiler Moorings in summer). The remaining four sites are each continuously occupied by a Coastal Profiler Mooring. 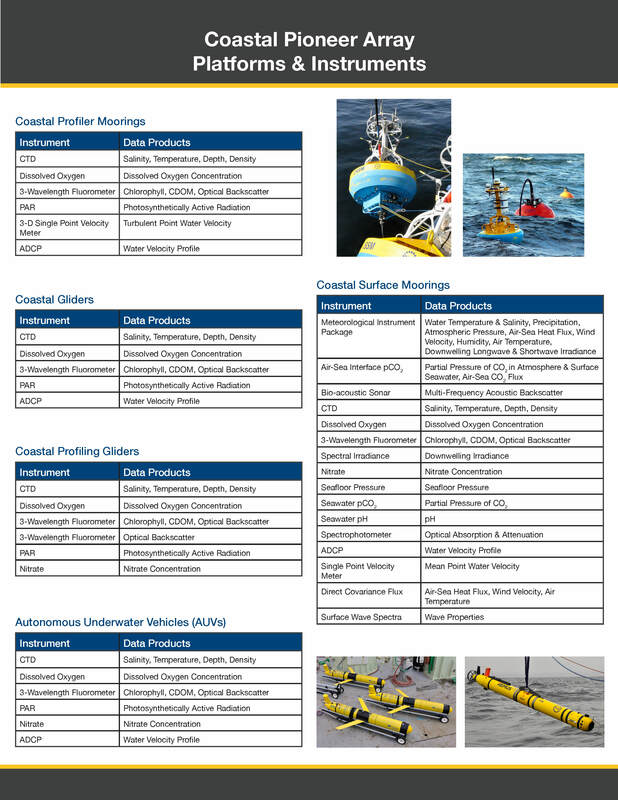 In order to provide synoptic, multi-scale observations of the outer continental shelf, shelf break region, and continental slope, the moored array is supplemented by ten mobile platforms – six Coastal Gliders, two Profiling Gliders, and two AUVs. The role of the Coastal Gliders is to monitor the mesoscale field of the slope sea and outer shelf, resolving rings, eddies and meanders from the Gulf Stream as they impinge on the shelf break front. Profiling gliders are used as “virtual moorings” at the Central and Inshore sites in the summer. The AUVs are the primary tools for resolving cross- and along-front “eddy fluxes” due to frontal instabilities, wind forcing, and mesoscale variability. For more information, check out the Pioneer Array related news stories.